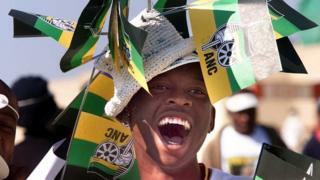 South Africa's ruling African National Congress is choosing a new leader to succeed Jacob Zuma this weekend. It starts on Saturday, and is arguably one of the most important conferences in the history of the party and the democratic country. Whoever wins would be well placed to become president of the country in the next general election in 2019. Well, the country is at something of a crossroads. The ANC has overwhelmingly won every election since 1994. That was the first election where people of every race were allowed to vote, and it brought white minority rule to an end. But Jacob Zuma's presidency has been mired in allegations of corruption. And for the first time in more than 20 years, there is a possibility that South Africans might turn their backs on the party that many see as having led them to liberation. Whoever wins this vote will either lead the ANC to its first national electoral defeat, or become president of the country. Who is voting and how does the vote work? The voting is done by party delegates, which are sent by branches to the conference. A branch needs to be "in good standing" to send delegates. Every branch with at least 100 members gets to send one delegate. For every 250 more, they get another. The party's various other sections, such as Youth, Women's and Veterans' Leagues, will each send 60 delegates. The leagues' delegates will come to 10% of the total number of delegates. The branches have already expressed their preferences by nominating who they would like for the top posts. In theory the delegates are supposed to vote in line with this. But it is a secret ballot, so it's impossible to know for sure which way it will go. Why is Jacob Zuma standing down? It is the end of his second term as leader of the the ANC. The rules of the party say he is not allowed to stand again, so he must stand down. Whilst both the ANC and the country elect a president every five years, those terms are not aligned, with the ANC choosing its president roughly 16 months before the national election. The next general election is in 2019, and Mr Zuma can stay on as president of the country until then. Why the fuss about Jacob Zuma? He has been the focus of much controversy, and there have been several attempts both from within his party and the opposition to remove him as president of the country through parliamentary votes of no confidence - all of which he has defeated. At issue is the allegation that he has a corrupt relationship with a wealthy Indian family, the Guptas, which has allowed them to influence ministerial appointments and exercise undue control over government departments. Both the President Zuma and the Gupta family deny any wrongdoing. 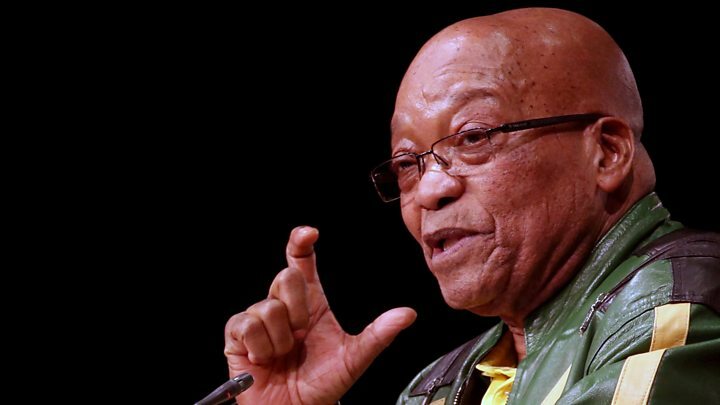 Mr Zuma is also facing the prospect that 18 charges of fraud and corruption relating to a 1999 arms deal could be reinstated. There are many who argue that whoever takes over might affect whether those charges end up in court. There are two leading candidates: Cyril Ramaphosa, who is currently the Deputy President, and Nkosazana Dlamini-Zuma, who is also Mr Zuma's former wife. Mr Ramaphosa is running on an anti-corruption ticket. But some analysts argue he is most popular with the middle class, and question whether he can galvanize the support of grassroots voters. However, he gained the most support from the ANC branches around the country. Ms Dlamini-Zuma is promising to put more of the country's economy - and land - back in black hands. But critics say she's too close to Jacob Zuma, and that chances of him being made to answer to the courts on those corruption allegations are slim if she wins. Who might succeed Jacob Zuma? Dlamini-Zuma - first female president? This has been a very bitter race, and the ANC is deeply split between Mr Zuma's supporters and those who want him gone as leader of the country. What the ANC leadership wants to avoid is two competing centres of power - the president of the country and the president of the party. There is also the issue of whether the ANC can afford to go into the next elections with someone who has been the subject of so much controversy still in such a powerful role. So the ANC leadership may choose to recall Mr Zuma as president of the country, as they did with Thabo Mbeki in 2008. How might a recall happen? The ANC can take a decision to recall its nominee from the position of president. After that, the constitution says there should be a vote in parliament, where the ANC has a huge majority, so any decision taken by the party is likely to be backed. Mr Mbeki was in a vulnerable position because he was no longer president of the ANC. He had also fallen out with the new president of the party - who was, ironically, Mr Zuma. In 2008, the ANC's highest organ - the National Executive Committee (NEC) - held a meeting through the night. Afterwards, a delegation was sent to Mr Mbeki's home to tell him he was being removed. Mr Mbeki then resigned as president of the country in a televised address to the nation.